One of the (many) things I'm trying to learn to be better at is forgiveness. I don't mean heavy-handed drama, rather at its most basic, letting things go. It is easy for me to choose which battles to fight, which are not worth the effort or are best left to other champions. But I'd like to learn how to let go of the anger I still sometimes feel even if I'm not acting on an "injustice." I look to examples set by others. A gracious word, genuinely laughing off a slight, or not letting an irritation under my skin in the first place are things I am better at than I used to be, but let's be honest, we all have our buttons! Last night offered a rare, public, shining moment in forgiveness. 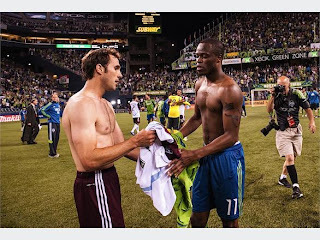 One of our local soccer players, Steve Zakuani, suffered a devastating injury over fourteen months ago when Brian Mullen from the Colorado Rapids carried out a sloppily-executed tackle that left Zakuani with a badly broken leg and resulting complications. You can read the full story here. Mullen was punished by the MLS with a 10-game suspension - the longest in MLS history. 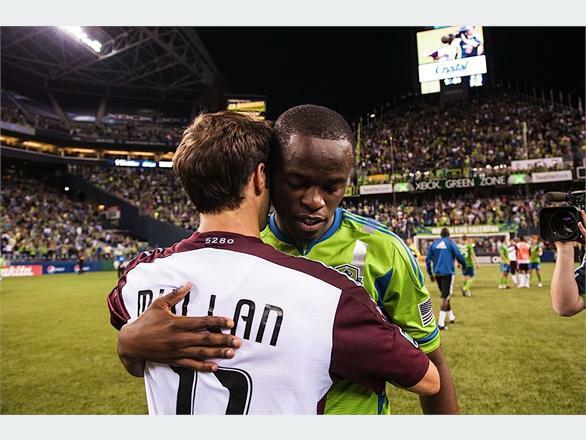 When Mullen was headed for his first game back post-suspension, Zakuani reached out and wished him well. 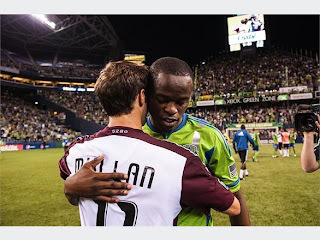 They spoke, and Zakuani forgave him. Fans in Seattle were not so soon to forgive. On Seattle's home turf, boos rain out every time Mullen has possession of the ball. A twitter hash tag #ClassyMullenHate was started with fans tweeting wishes of calamities to happen to Mullen and Colorado which, while often humorous, were still barbs born of resentment for Mullen's having taken Seattle's #1 draft pick out of play. But after more than fourteen months of mental and physical preparation, Zakuani was listed as being on the reserve bench for last night's Sounders home game - against the Colorado Rapids, and Brian Mullen. 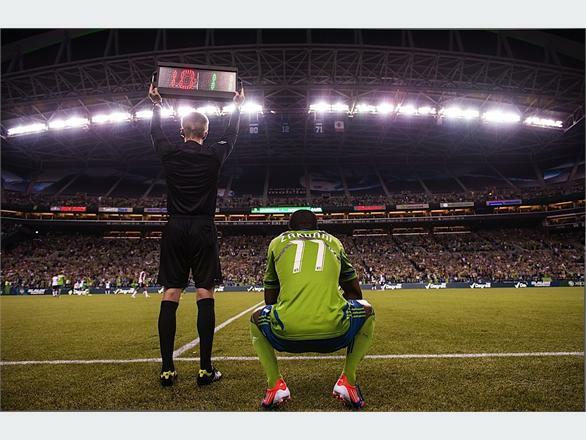 With five minutes of regular play left to go, Seattle used their final substitution to put Steve Zakuani in play. 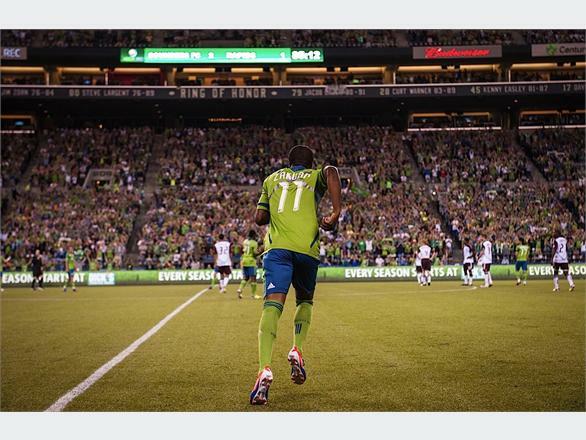 Photo credit to Seattle Sounders @ soundersfc.com. In what is being called one of the best moments of MLS soccer history, Zakuani took the field to thunderous applause and helped keep the score to a 2-1 Sounders victory over the Colorado team. ...and they traded jerseys, a traditional sign of respect between soccer players. Zakuani bookends the gesture by saying: "I have said from day one that I do not have any issues with [Mullan]. I forgave him a long time ago, but I think it is a good thing for the public to see, for closure. Now I think that he can go on with his career and I can start to do the same...He took my shirt home and I am taking his shirt home and I think that chapter is closed now." Closed, but with a lot of misty-eyed fans in his wake. And lessons about forgiveness well-taught.